Official Dragonlance Movie Site | Dragonlance Movie Site Book Shop. For the best Dragonlance books, novels, and DVDs. Order your Dragonlance books and gaming materials at discounted prices through the Dragonlance Movie Site's association with Amazon.com. Note that all prices are in US Dollars. Available now on CD and in MP3 format, this is Karl Preusser's score for the animated feature film version of the first book in the Dragonlance Chronicles series. Order now! Available now on DVD, this is the animated feature film version of the first book in the Dragonlance Chronicles series. Features the voices of Kiefer Sutherland (Raistlin), Lucy Lawless (Goldmoon), and Michael Rosenbaum (Tanis). Order now! This beautiful new leatherbound edition of the Dragonlance Chronicles saga marks the first time this story has ever been available for purchase in a premium format. A leather, embossed cover and gilt-edged pages bring a new level of sophistication to the three titles collected inside: Dragons of Autumn Twilight, Dragons of Winter Night, and Dragons of Spring Dawning. This annotated edition will display beautifully on any shelf and marks the Chronicles trilogy as one of the true classics in fantasy literature. The Companions are back! In an untold story from the War of the Lance, the companions have saved the refugees of Pax Tharkas and led them to a hidden valley. For a time, they are safe, but the forces of the Dragon Army are in pursuit. As Tanis and Flint seek out a haven in the dwarven kingdom of Thorbardin, the rest of the companions face their own challenges. Raistlin is strangely drawn to the haunted fortress known as Skullcap. Sturm seeks the legendary Hammer of Kharas, the forging tool of the fabled dragonlances, while Tika Waylan must make a perilous journey to rescue those she loves from certain death. Following on from the excellent Anotated Chronicles, Margaret Weis and Tracy Hickman have revisited the Legends trilogy, compiling notes, comentary, and original source material, and adding their observations to a new volume which is a must-have for serious Dragonlance fans. Wizards of the Coast have released a beautiful new boxed set of the complete Dragonlance Legends series: Time of the Twins, War of the Twins, and Test of the Twins. A must for any serious Dragonlance fan. This book features artwork from Dragonlance novels, games, calendars, and other materials created over the past ten years. With pieces from artists such as Brom, Matt Stawicki, Mark Zug, Todd Lockwood, Larry Elmore, and more, this collection highlights some of the best fantasy art published over the last decade. Weis & Hickman's epic War of the Souls trilogy is now complete, and the face of Krynn will never be the same again. The Dragonlance Chronicles, to roots of where it all started. These new editions of the classic novels have wonderful new cover art. Amazon says think of these "... as A New Hope for the world of Dragonlance: Sure, maybe it's a little rough around the edges, maybe it's got one cliché too many, but this baby is pure magic." This sequel to Leaves from the Inn of the Last Home contains all new material about Krynn during the Fifth Age, edited and collected by Margaret Weis and Tracy Hickman. More Leaves from the Inn of the Last Home compiles songs, poems, gnomish machines, and kender taunts. It details mythic people, scary monsters, legendary places, plus recipes and a Krynn almanac. The beginning of the epic story that has won the hearts of more than sixteen million readers worldwide. 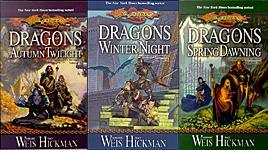 Now Margaret Weis and Tracy Hickman have added to Dragons of Autumn Twilight, Dragons of Winter Night and Dragons of Spring Dawn notes, commentary, and original source material and offer observations of the fifteen-year phenomenon that is the Dragonlance saga. Finally one of the most popular Dragonlance source books is being reprinted. All of the Dragonlance artists discuss their work and the world of Krynn. The artwork is nothing short of amazing. Forward by Margaret Weis & Tracy Hickman. The original Dragonlance AD&D modules (DL1-15) are re-released in this marvelous volume, which Tracy Hickman calls "... a remarkable, fresh and lovingly crafted retelling of the original adventure game."